Home › Naturopatia › NFkB e IKB l’On-Off dell’infiammazione, Zenzero, Boswellia e Curcuma le piante che spengono l’infiammazione. NFkB e IKB l’On-Off dell’infiammazione, Zenzero, Boswellia e Curcuma le piante che spengono l’infiammazione. Normalmente risiede nel citoplasma cellulare legato e tenuto fuori dal nucleo da una serie di sostanze chiamate IkB (Inibhitor of Kappa Beta). 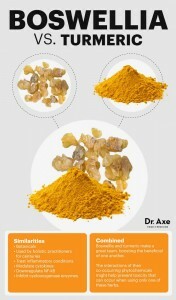 Alcune sostanze naturali presenti nelle spezie e nei cibi vegetali possono mantenere legato l’NF-kB all’IKB, tra queste la Curcumina (Curcuma Longa), lo Zenzero e molti altri polifenoli presenti in frutta e verdura. Alcuni minerali quali il Magnesio, lo Zinco e il Cromo presenti nell’alimentazione vegetariana, nei carboidrati integrali, nei semi oleosi e nella frutta secca. Specialmente l’infiammazione cronica crea un disequilibrio della risposta immunologica con una diminuzione dell’attività del sistema immunitario adattativo (Linfociti TH-TH1, TH2) detto immunosenescenza e un aumentodell’attività proinfiammatoria del sistema immunitario umorale, detta inflammaging. Innate and adaptive immunity are the major defence mechanisms of higher organisms against inherent and environmental threats. Innate immunity is present already in unicellular organisms but evolution has added novel adaptive immune mechanisms to the defence armament. Interestingly, during aging, adaptive immunity significantly declines, a phenomenon called immunosenescence, whereas innate immunity seems to be activated which induces a characteristic pro-inflammatory profile. This process is called inflamm-aging. The recognition and signaling mechanisms involved in innate immunity have been conserved during evolution. The master regulator of the innate immunity is the NF-kB system, an ancient signaling pathway found in both insects and vertebrates. 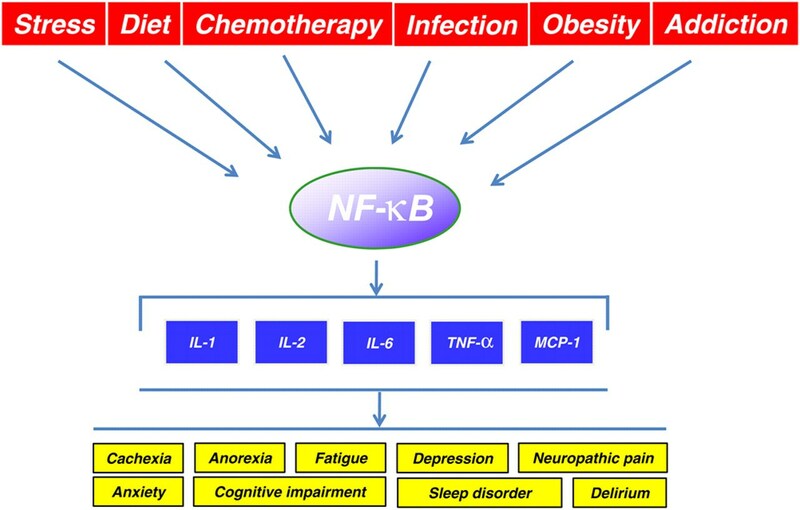 The NF-kB system is in the nodal point linking together the pathogenic assault signals and cellular danger signals and then organizing the cellular resistance. Recent studies have revealed that SIRT1 (Sir2 homolog) and FoxO (DAF-16), the key regulators of aging in budding yeast and Caenorhabditis elegans models, regulate the efficiency of NF-kB signaling and the level of inflammatory responses. We will review the role of innate immunity signaling in the aging process and examine the function of NF-kB system in the organization of defence mechanisms and in addition, its interactions with the protein products of several gerontogenes. Our conclusion is that NF-kB signaling seems to be the culprit of inflamm-aging, since this signaling system integrates the intracellular regulation of immune responses in both aging and age-related diseases. In particolare tre piante hanno una spiccata azione inibente nei confronti dell’NFkB, lo ZENZERO, la BOSWELLIA SERRATA e la CURCUMA LONGA. Ecco alcuni studi che dimostrano l’azione inibente dell’NFkB in varie situazioni infiammatorie: lo zenzero e la prevenzione del cancro alle ovaie, la boswellia e l’azione anti NFkB nell’ateroma, i curcuminoidi e le proprietà antinfiammatorie e anticancro, anti steatosi e cancro al fegato. Meglio se vengono usate insieme e per quanto riguarda la Curcuma e la Boswellia sotto forma di estratti secchi titolati e resi biodisponibili con l’aggiunta di piperina e/o in forma fitosomiale. Ginger (Zingiber officinale Rosc) is a natural dietary component with antioxidant and anticarcinogenic properties. The ginger component -gingerol has been shown to exert anti-inflammatory effects through mediation of NF-κB. 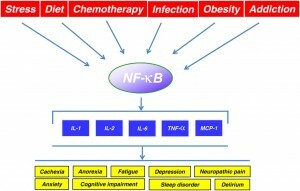 NF-κB can be constitutively activated in epithelial ovarian cancer cells and may contribute towards increased transcription and translation of angiogenic factors. ……Ginger treatment resulted in inhibition of NF-kB activation as well as diminished secretion of VEGF and IL-8. Atherosclerotic lesions were induced by weekly LPS injection in apoE-/- mice. LPS alone increased atherosclerotic lesion size by approximately 100%, and treatment with AKbetaBA significantly reduced it by approximately 50%. Moreover, the activity of NF-kappaB was also reduced in the atherosclerotic plaques of LPS-injected apoE-/- mice treated with AKbetaBA. As a consequence, AKbetaBA treatment led to a significant downregulation of several NF-kappaB-dependent genes such as MCP-1, MCP-3, IL-1alpha, MIP-2, VEGF, and TF. …. The inhibition of NF-kappaB activity by plant resins from species of the Boswellia family might represent an alternative for classical medicine treatments for chronic inflammatory diseases such as atherosclerosis. J Hepatol. Author manuscript; available in PMC 2016 Sep 1. Leclercq IA1, Farrell GC, Sempoux C, dela Peña A, Horsmans Y.